I had send out some 35 plus books for people to read for free. I came upon some hard times this past summer and some folks go upset that I could not mail the books out as fast as I would like to. Sorry about the delay, but life happens. 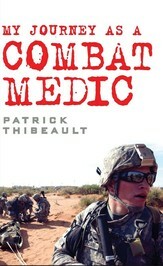 I appreciate the reviews ( the few reviews) that people made about My Journey as a Combat Medic. I really do, good or bad or otherwise. I see you live in Layfayette, In, I live in north west Indiana in Cedar Lake "
" I served as a combat medic in Afghanistan and earlier on in Desert Storm. I have found the word beneficial in helping me clear my head and making sens I served as a combat medic in Afghanistan and earlier on in Desert Storm. I have found the word beneficial in helping me clear my head and making sense of my life.
" Combat Medic Poetry is available now on Amazon, BN and iTunes.
" I put away the poems for several months and I have been working on them again. I appreciate the input from everyone. I want my poems to stir the sense I put away the poems for several months and I have been working on them again. I appreciate the input from everyone. I want my poems to stir the senses. ...more "
" The audiobook version of my book is out. I used Audible to make the audiobook and I was highly pleased with the narrator that I chose. It made even me The audiobook version of my book is out. I used Audible to make the audiobook and I was highly pleased with the narrator that I chose. It made even me the author want to listen to my own story again ! Please check out my website at www.medicstory.com ...more "
Hi Patrick! Thanks for being my friend on Goodreads! I hope you will consider putting my books,Harrison Davis: Proof Beyond a Reasonable Doubt and Gunar Hamilton: Vigilante on the Lam, on your to-read list!